NOTE: I do not feel that anything I discuss in this review constitutes as a spoiler – I took great pains to ensure this – however, I realize that people tend to be especially spoiler-phobic when it comes to Christopher Nolan movies, so in an attempt to avoid people shouting at me, please be aware that this review discusses the basic set-up of the film as well of a few of its major themes. You know, the things that you kind of have to talk about when reviewing a movie. Interstellar is a film that I desperately want to talk about, but at the same time I feel woefully ill-equipped to do so. It’s a movie that is so dense with images and metaphors that even finding a place to start breaking it down feels like an insurmountable task. It’s a movie that is alternatively a stunning achievement in cinema and a clumsy attempt at evoking ideas and themes from other works; a film that is at once awe-inspiring yet lacking in wonder. Interstellar is a contradiction. I suppose I might as well begin by addressing the elephant in the room, which is the widely known fact that the original script for this film was written for Steven Spielberg. Both Speilberg and Nolan are filmmakers that I very much admire, but they are filmmakers with fundamentally different sensibilities. Spielberg is THE master of tone. He’s a filmmaker who imbues every frame of his films with humanity and emotion and who can wrangle disparate tones to bring the audience through that emotional journey with the characters. This has led some critics to describe his work as “schmaltzy” or “sappy,” but they miss the point. Spielberg is cinema’s great optimist, someone who believes in the innate potential for humanity to be better than they are, and his films don’t shy away from depicting people at their very worst in order to make it all the more powerful when they triumph over that evil. Nolan, on the other hand, is at his best when exploring cinema’s potential for sleight of hand and narrative trickery. He’s fascinated by movies on a mechanical level, deconstructing tropes of the form to subvert expectations and to comment on the very nature of storytelling. His best films have a certain meta-textual quality, whether it’s The Prestige commenting on cinema as a magic act, or Inception exploring the notion of people crafting a shared dream in order to plant an idea in the dreamer’s mind. Traditionally Nolan’s greatest weakness has been exploring emotional character arcs, things that must be felt rather than understood. To simplify this difference to a dangerous and arguably irresponsible level, Nolan’s films force an audience to think while Spielberg’s films force an audience to feel. It’s this difference in method that makes the beginning of Interstellar so tremendously frustrating. 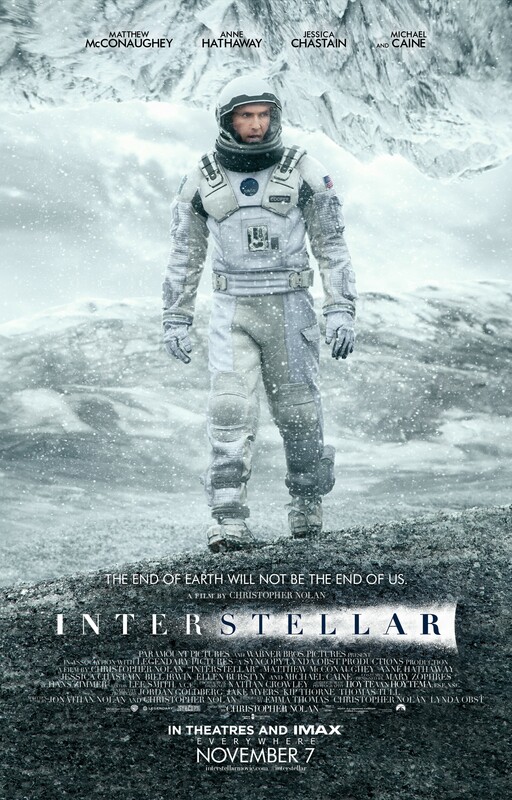 The first hour of Interstellar feels like a lost Amblin film. It’s drenched in the aesthetic of late ‘70s/early ‘80s Spielberg – a typical, all-American family that is unexpectedly thrust into a discovery that threatens familial bonds but has the potential to change the world. It’s space age wonder pushed up against Cold War tensions and fear. The problem is that where Spielberg explored these themes through the eyes of a child, Nolan can only look at them as an adult. A major theme of the movie is reconciling the need to save a species with the instinct to protect your loved-ones, and here, in the most crucial moments, it all falls flat. From the perspective the film gives us it’s clear what the answer is: Cooper (Matthew McConaughey) needs to leave for the sake of the entire human race. As a rational, thinking adult, this is the “right” choice, but the film really fails to let us into the mind of Cooper’s young daughter, Murphey, who is devastated at the idea that her father could be gone for most of her life, perhaps forever. The film allows us to see the objective truth of the situation, but never to feel the emotional truth that Murph needs her father, and because of this, we never feel the stakes of the situation. It undercuts the whole thematic through line for the rest of the film. It’s perhaps unfair to bring in this kind of extra-textual baggage from the development process of the movie, but the beginning of Interstellar CONSTANTLY reminds you that this was a movie at one point written for Spielberg. There’s no way you can avoid that comparison when the movie is begging for it. Fortunately, though, once the film leaves Earth it stops trying to be a Spielberg film and finally starts getting into territory that Nolan is interested in. It becomes a puzzle wherein the characters must accomplish a clearly definable goal using a carefully explained set of resources. Nolan plays with inter-dimensional travel and the theory of relativity like they’re pieces on a chessboard, and this is exactly what he’s good at: setting up the rules of a game and letting it play out with some unexpected surprises along the way. It’s here that the movie feels like a spiritual successor to Inception and brings back memories of the best moments of that film. I won’t go into specifics, because half the fun comes from seeing this Rube Goldberg story machine reveal each of its tricks as the narrative moves forward, but this is when the movie absolutely soars. There’s another aspect to this part of the movie, though, and one that I’m not entirely sure how I feel about. Once the crew of the Endurance reaches outer space, Nolan begins very explicitly referencing 2001: A Space Odyssey; riffing on ideas and themes and even borrowing the visual language from that film to inform his story. In many ways, Interstellar – particularly later in the film – feels like a cinematic response to Kubrick’s classic. It acts as a commentary and often a rebuttal to the themes explored in that film. This is so much a part of the film’s identity, that 2001 really becomes required viewing for anyone who intends to watch Interstellar. If you haven’t seen 2001, the entire climax of the film will be completely unintelligible for all but a surface level reading. I’ll be honest and say that this element threw me for a loop. I sought out very little information about the film prior to release, and knew little more than its basic premise, and so when it became a response paper to the 1968 film I wasn’t prepared for it. It’s interesting, and compelling, but I really feel that I need another viewing to unpack what it’s trying to say here. I will say, though, that Kubrick captured space in a way that Nolan doesn’t. Kubrick’s camera drifts through space as Strauss plays, while Nolan’s IMAX camera is anchored to the side of a rocket that dominates the frame. Kubrick lets us soak in the majesty and the wonder of the cosmos, while Nolan often only gives us glimpses of it from behind man-made contraptions. Even in last year’s Gravity space is a character – a presence that is always present, even when you can’t see it. There are moments of supreme beauty in Interstellar, but space is often just a background, the setting for the adventure, but not the star. It’s a strange and sometimes frustrating choice, especially when moments that should be powerful (the initial flight into space) feel hampered when you feel as though the camera is pointed at the wrong things. I’m still very conflicted on this film. So much of it works, but the elements that don’t are kind of a big deal. I realize this review comes across as largely negative, but a lot of that is a result of the fact that the stuff that works is immensely difficult to talk about while treading lightly around the issue of spoilers. In this film, it’s not the major plot reveals you need to be wary of, but rather the sense of discovery that comes in the middle of the film. At its best, Interstellar is a gripping tale of exploration, filled with big, bold ideas and awe-inspiring moments. At it’s worst, though, it’s a movie that feels like it should have been made by a different filmmaker. It’s a movie that contains greatness, but is itself not a great film, and it’s one I expect to have a complicated relationship with for many years to come. I’m surprised that you didn’t weight at all into the politics of the film, which has come under fire from both the right (which doesn’t like the assumption that climate change occurs) and the left (which assumes the film ridicules the reductionist position of the climate change movement in favor of the science will be our salvation approach of people like William Happer). Given your recent foray into the politics of videogames, would be curious to know your thoughts. The reason I didn’t really get into any of that is because the film, at least to me, doesn’t really feel like it’s taking any sort of strong political stance. News pundits and the like LOVE to politicize popular movies, and sometimes they do pick up on legitimate themes, but I don’t think that’s the case with this one. In The Dark Knight, for instance, there are many interesting conversations we can have about the politics of that movie in regards to the Bush administration, government surveilance, response to terrorism, and the fact that it was released in a presidential election year. Interstellar, though, seems far less concerned with politics than it does advocating science, specifically space exploration, and commenting on Kubrick’s 2001. The idea that being “pro-science” is a political stance is simply indicative of the fact that American politics have descended into horrifying stupidity. i agree with you on pretty much all of your points. One of the most frustrating things for me watching this movie was the what you touched on in comparing Kubrick to Nolan. There were so many shots in Interstellar that were absolutely breathtaking, and then Nolan would cut way to early. I understand the idea of leaving the viewer wanting more, but many times we didn’t get enough. Overall, i loved it. Best hard scifi movie i’ve seen recently, and definately ranks among my favorites. Yeah, after watching it a second time I was amazed at how much time we spend inside spaceships. If they had taken some of that screen time and given it to space footage the movie would have had much more of that sense of wonder. I really your style of writing and extensive vocabulary! I’m a very big fan of your writing!